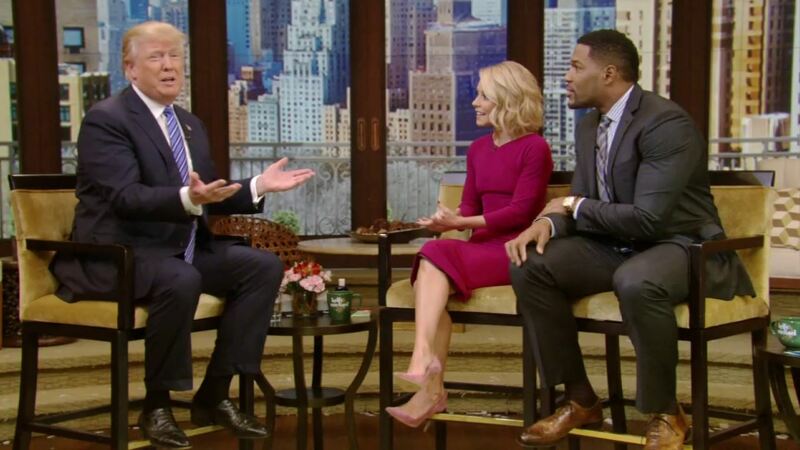 UPPER WEST SIDE, New York -- GOP presidential candidate Donald Trump appeared on "LIVE with Kelly and Michael" Wednesday, to talk about concerns over his proposed ban on Muslims in the United States and where he stands in the presidential race. He responded to the criticism he has faced over comments made earlier this week about banning Muslims from entering the United States. "We're going to have tremendous problems. It's getting worse and worse, and those problems are coming from a certain sector," said Trump during the show. "Our country has to get its act together." He emphasized that the ban would be for a limited period of time. "We need safety," said Trump. "It's not about religion, this is about safety." "I say things that are absolutely correct, and sometimes, they're not politically correct and sometimes people don't agree with them," Trump said,but added that he finds the public does agree with him. "I tell the truth." Trump also had some sharp words for likely Democratic presidential nominee Hillary Clinton. "She doesn't have the strength or the stamina," he said. Asked if he could beat her, he said, "I think I would." On selecting a vice presidential candidate, Trump said he is focusing on winning the nomination right now. He would not mention any names, but said he has thought about a running partner. He joked afterwards that he would make Ivanka, his daughter, vice president. Trump also said he does not want to run as a third-party candidate, pointing out that as a Republican candidate he has a substantial lead in polls right now. But he left the door open in case, "I don't get treated fairly" by his party. "I don't think I have a competitor," he said, as the audience cheered, referring to other possible GOP nominees. He said that he thinks Clinton is his main competition. He also emphasized that he is self funded, saying, "I can't be bought." After the show, Trump told Eyewitness News reporter Dave Evans that he believes he will get the Republican nomination, but acknowledged that the party is "a little bit stunned" at Trump's success so far. During the show, Trump was asked about his plan to build a wall along the United States' border with Mexico. He said if people wanted to come in, they would need to do so legally. "This is a wall. It will be built," he said. "It will keep drugs out." Photo of Trump arriving for his appearance on "Kelly and Michael:"